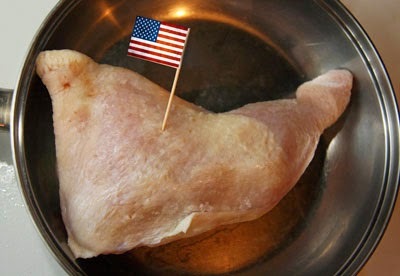 Nine years ago I posted about "Bush's legs" (American chicken imported into Russia). Now they're in the news again--thanks to the latest Russian pushback against Western sanctions, they may be replaced by imports from Brazil, Chile, or Israel. Commentators vary in assessing the possible effects of the Russian ban on imported agricultural products. A few minutes ago I scanned the Web sites of the supermarkets we use in Russia, and didn't see any evidence of alarm of massive changes in their offerings. I know it will take some time before the full effect of the food ban will be obvious. In the meantime, it is very frustrating to experience all this sparring from just one side of the sanctions divide. 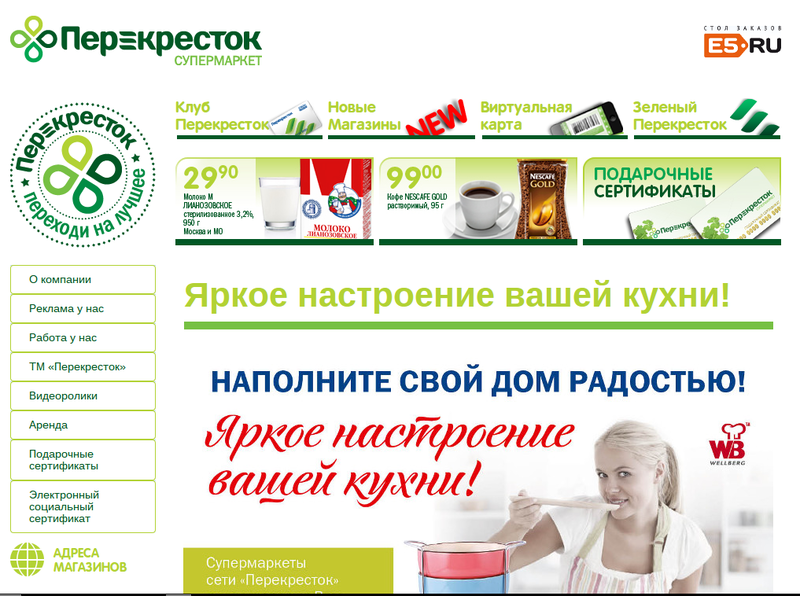 Perekrestok is still advertising Spanish olive oil and Nescafe Gold instant coffee today. 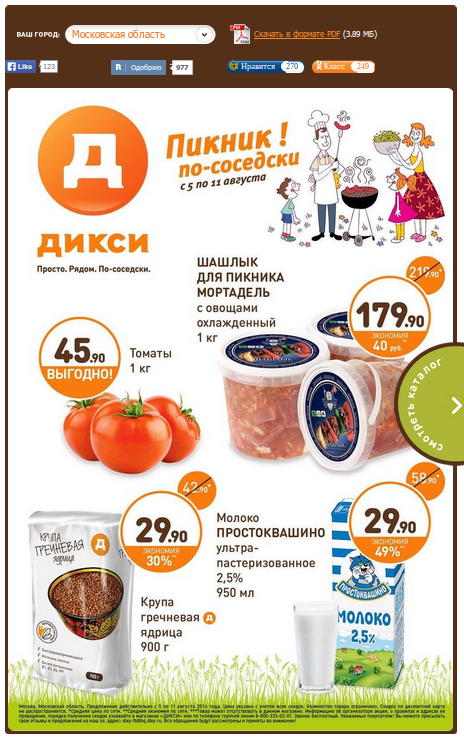 On the other hand, Dixie's site is emphasizing Russian products in its picnic theme. (And a good price on milk!) Of course it's impossible to make any generalizations from Web sites--we'll have to wait to hear from actual consumers. Whatever the effect on Russian markets and consumers, there will be an impact on Western economies trying to absorb the production and the loss of income. With Italy's problems in the mix, the European Union is facing a shaky time. That's not my estimation. If you look at the markets and you look at estimates in terms of capital flight, if you look at projections for Russian growth, what you're seeing is that the economy has ground to a halt. It has presented the choice to President Putin as to whether he is going to try to resolve the issues in eastern Ukraine through diplomacy and peaceful means ... or alternatively continue on the course he's on, in which case he's going to be hurting his economy, and hurting his own people over the long term. We have supposedly "presented a choice." Does anyone really believe that the president of Russia, or any president of any country, would respond along the lines of the fantasy implied in Obama's words? "Oh my goodness, thanks to these sanctions I've seen the light! We have no choice but to bow before the USA's superior wisdom and shining idealism, and confirm our utter dependence on the good graces of the West by reversing any actions they find objectionable." This is not an unconditional endorsement of Russia. If Russia continues to treat the world as if everything is someone else's fault, and to govern domestically through mythology and crude populism (a tactic not unknown in the USA! ), its most important export will continue to be a significant percentage of its most talented people--an outcome that's no good for anyone. Sanctions don't help counter that scenario, but probably boost it. Is passivity our only alternative in the current crisis? No! Along with a certain humility and recognition that there are never any clean quick fixes, we can recommit to a far more energetic and creative engagement with Russia (and with Ukraine, for that matter). Why are academic exchanges and Russian studies programs being scaled back just when we need to build bridges of mutual understanding? Money that is now spent on growling and threatening could be used far more creatively to invest in each other's future leaders, diplomats, businesspeople, academics, journalists, farmers, and artists. Tourism paperwork has recently been simplified on both sides--let's flood each other's countries with ordinary curious people! The desire of the space exploration communities of Russia and the West to continue collaborating despite all strains should be a vivid lesson to the rest of us. All of this is so obvious it seems ridiculous to say, and the structures (however undersupported) already exist for these activities, but politicians seem trapped by the need to pander to those sectors of their voting publics who have the least interest in long-term international peace. It's going to be up to us to keep pushing for people-to-people ties, to challenge enemy language, to support more creative approaches, and, most important of all, to visit each other's lands and see for ourselves. Friday update: The USA has just delivered a near-perfect justification for any Russian intervention in eastern Ukraine with today's American air attacks in Iraq. If the USA is entitled to bomb targets half a planet away for allegedly humanitarian goals, why should Russia not intervene to stop the bloodshed a few kilometers from its own border? Yes, the USA has a lot of recent history in Iraq--and so does Russia in Ukraine. The habits of imperialism have deep roots in both countries and we should be suspicious of glib comparisons, but it's interesting to see how quickly we Americans conclude that we have a special license to intervene wherever we choose, while other countries must follow the rules we prescribe. As a Christian, I absolutely reject the logic of imperialism wherever it claims to apply. In the present cases, neither country should be aiming guns and bombs at anyone, period. But for those who subscribe to the conventional wisdom of empires, I wish they'd at least be consistent. Want to practice your peacemaking skills? How about a game that emphasizes ending conflicts rather than winning them? A couple of weeks ago I mentioned the Unified Front board game. Today Bennett Hutchinson, originator and co-designer of the game, told me that it's now commercially available through the Game Crafter Web site. See the site for more information. "Is this the end for Christianity in Iraq?" "Nine things pastors can do besides pray for Gaza." "Death, Resurrection, and Carlton Fisk's World Series Home Run." "The Rise to Power of the National Security State." "As every schoolchild knows, there are three check-and-balance branches of the U.S. government: the executive, Congress, and the judiciary. That’s bedrock Americanism and the most basic high school civics material. Only one problem: it’s just not so." More on Americans' views on the U.S. Supreme Court's "Hobby Lobby" ruling. Kaiser's study included implications for other health-care related concerns, but apparently did not extend to implications of the Supreme Court ruling for non-health-care issues, such as conscientious objection and war taxes, and churches' defense of immigrants. For blues dessert, a real time-capsule gem: Johnny Otis, "Willie and the Hand Jive." (Enjoy the car dealer ad, too!) See more about the fascinating Johnny Otis on Wikipedia.